Sagless burlap is very tightly woven and heavyweight at 17.2 ounces. It is traditionally used for support when upholstering high-end furniture, but it has many other uses, including crafts, totes, soundproofing, and painting. Heavier weight burlap for making a roller shade. Because it's tightly woven! Been looking for that to use on crafts that require it. I saw that Marian Parsons (Miss Mustard Seed) used it on a sofa for exterior upholstery and I will do the same. Great quality for craft projects. I was looking for a good burlap without the smell and leaving all the frizzies behind! I've reordered this a few times. It works great for painting on. Best I've found by far. Heard about it on Miss Mustard Seed blog! I'm using this for upholstery. I chose this to make tote bags. It's very heavy and works great. This will be used for crafting hobby. It is far less expensive from the online fabric store than online and in store craft sites. Buying it by the yard saves money in the long run. Another person had used it for reupholstering the back of her sofa and said was the only burlap appropriate for upholstering. Now that I see my sample, I love the tightness of it and plan to reupholster the outside of a barrel chair. I cant seem to find the sagless burlap at my local fabric store. I found it on OFS website. i'm looking forward to receiving it. I ordered this because Miss Mustard Seed used this on a beautiful couch and I am going to use it for 2 antique chairs. Upholster back/sides of a French bergere. Looking for example of heavy natural burlap to make tug toys and bite suits for training K-9's. This looks like what I have been searching for. --using this for the back upholstery on a set of Louis chairs. I needed a tight weave burlap to reupholster two old chairs. The tight weave allows you to keep your line when folding, sewing, and tacking your burlap. Would this work for a sofa slip cover? You would probably need to attach several pieces together to get your desired width since this fabric is only 36" wide. The texture might also be unpleasant to sit on depending on your sensitivity to burlap! Good morning, if I use this to cover a chair, will the material be soft enough? BEST ANSWER: I would only suggest it for the back of a chair, since it is a more rustic fabric and it sheds a lot. It wouldn't be ideal for an entire chair. Is this burlap treated with any chemicals? BEST ANSWER: This fabric is not treated. The only "chemical" in question would be the oil that is used to lubricate the weaving machines. BEST ANSWER: No it's not. But it is VERY thick material. We are planning on covering the top half of our natural wood walls in our house. The house was built in 1897 and originally had some sort of burlap-type covering on the top half of the walls. Would this fabric be too heavy to work with? I think the plain burlap is too thin and see through. Any comments/ideas are appreciated. Thanks! BEST ANSWER: I think this burlap would work. It isn’t super heavy and definitely isn’t see through. I use it for a lot of art projects. Is the fabric comfortable and soft or scratchy to the touch? BEST ANSWER: I used this fabric for the interior springed seat frames of a patio sofa and chair, replacing original burlap from mid 1960’s which only became damaged due to exposure to water, rusting framework and rot. Had the furniture not been exposed to water, I believe the original fabric would still be fine. With the new burlap, the furniture is good as new. I chose heavy duck canvas for the cushion upholstery. As far as burlap’s go, it’s pretty soft and may soften up more with use. But it is scratchy by nature. I would only use as upholstery for back and side areas. Burlap is inherently scratchy so we wouldn't recommend it for anything your skin's going to be against. Can this be used for cat scratching posts? BEST ANSWER: You could definitely use this for scratching posts. We recommend ordering a sample to determine if this will be appropriate for your project. BEST ANSWER: Yes, we have this product in stock. BEST ANSWER: This is the only color we offer in sagless burlap. Can I use this for a backing of stationary, I would like to glue card stock onto this? When you cut it, does it fray? BEST ANSWER: It won't fray as much as regular burlap, but it will still fray. We recommend ordering a sample to see if it will work for your project. Is this Sagless Burlap a product you always carry? Can it be cleaned does anyone know? Thank you! BEST ANSWER: Yes, we do carry this product regularly. Burlap should be hand washed with cold water and a small amount of gentle detergent. Do not leave in water to soak. Rinse the fabric well and leave it to dry flat between two towels. For stains, blot the burlap (do not scrub or rub) with a wet sponge, blot up the water with a towel immediately after. I AM MAKING DECORATOR PILLOWS ON WHICH I HAND-STITCH DESIGNS OR HOOK ON, WILL THIS WORK? I would like to use this for a decorative window treatment. would this be workable? Are there special needles required when sewing this type of burlap? Great to use under what you use for cushion material and the seat springs. really enjoy working with this fabric ! I replaced old (mid 1960’s) sagless burlap damaged by water, rust and rot with this. It was easy to work with and functions perfectly. 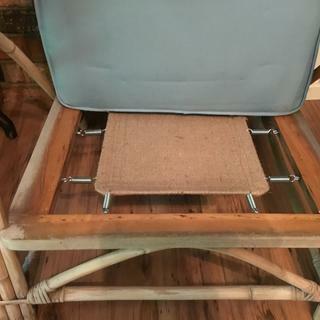 It covers heavy metal wire frame that is surrounded with attached springs that hold it to the furniture frame and support the seat cushions and all who sit there. Good as new! I’m so pleased with this product. Beautiful fabric and excellent quality. Only place you'll find upholstery burlap. Can't wait to use it on my project. I put the fabric back of vintage sofa when I reupholstered it. It turned out great. The customer who bought that sofa loved it. I like the fabric and price is also very reasonable.